NEW YORK -- From the 1690s through 1794, a six and a half acre site in Lower Manhattan was used as a burial ground for both free and enslaved Africans. Despite being the resting place of over 15,000 people, the site remained unknown until construction workers preparing to build a new federal office building discovered it in 1991. Since then, the burial ground has allowed historians to learn more about the African American population in New York during the 18th century. In 2003, the human remains found there were re-interred in a ceremony that brought national and international attention. The National Park Service constructed a permanent memorial at the site, designed to honor the significance of the discovery and the location. 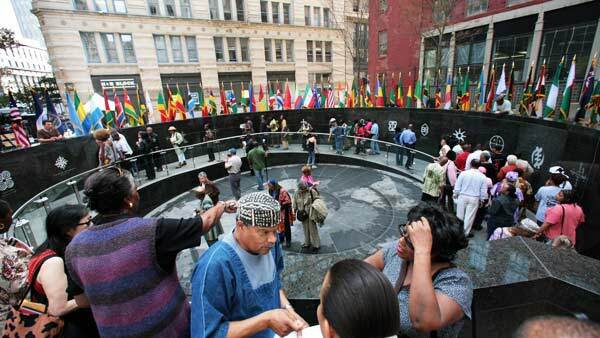 The African Burial Ground Memorial was dedicated in 2007. Today, people can explore it via a visitor's center, tours of the site, and permanent works of art installed nearby.